© 2018 The Korean Society of Plant Pathology. Received November 6, 2017; Revised November 22, 2017; Accepted December 4, 2017. From 2014 to 2016, Fusarium wilt disease was found on fassionfruit in Iksan and Jeju, Korea. Symptoms included wilting of foliage, drying and withering of leaves, and stunting of the plants. The infected plants eventually died during growth. Colonies on potato dextrose agar were pinkish white, and felted with cottony and aerial mycelia with 35 mm after one week. Macroconidia were falcate to almost straight, thin-walled and usually 2-3 septate. Microconidia were usually formed on monophialides of the hyphae and were hyaline, smooth, oval to ellipsoidal, aseptate or medianly 1-septate, very occasionally 2-septate, slightly constricted at the septa, 3-12 × 2.5-6 µm. On the basis of the morphological characteristics and phylogenetic analyses of two molecular markers, internal transcribed spacer rDNA and translation elongation factor 1α, the fungus was identified as Fusarium oxysporum. Pathogenicity of a representative isolate was proved by artificial inoculation, fulfilling Koch’s postulates. To our knowledge, this is the first report on the occurrence of F. oxysporum on fassionfruit in Korea. 패션프루트(백향과; Passiflora edulis Sims)는 시계꽃과(Passifloraceae)에 속하는 열대성 덩굴 과일로 남미의 브라질이 원산지이며, 전 세계의 열대 지방에서 재배된다. 과일은 젤리 상태의 과육으로 달지만 신맛이 강해 주스나 잼으로 가공하며, 과실로 만든 주스나 시럽은 젤리, 무스, 셔벗, 아이스크림 등을 만드는 데 사용된다(Rural Development Administration, 2014). 원산지인 브라질에서 패션프루트는 세계에서 많이 재배되고 소비되는 작목으로 약 62천ha에서 매년 920천톤이 생산되고 있으며, 패션프루트 재배에 있어서 Fusarium oxysporum f. sp. passiflorae는 가장 치명적인 생산량 감소와 경제적 피해를 일으키는 병해로 알려져 있다(Silva 등, 2013). Fusarium은 식물체의 뿌리와 도관부를 침입하여 물이나 영양분의 체내 이동을 막는 병원균으로 알려져 있으며, 후벽포자를 형성하여 토양 내에서 오랫동안 생존 가능하다(Agrios, 2005). 우리나라의 경우 아열대 원예작물의 재배 가능 지역이 남부지역부터 점차 확대됨에 따라 다양한 아열대 작물이 국내에 도입되어 재배가 시도되고 있다. 그 중 해외 수입에만 의존하던 패션프루트의 상업적인 재배가 2000년대부터 시작되어 제주, 전라, 경상, 충청 및 경기 등의 지역으로 확대되었으며, 전체 재배 면적이 2014년도 9.4 ha에서 2015년도 44.4 ha에 달할 정도로 급격히 증가하고 있다(Ministry of Agriculture, Food and Rural Affairs, 2017). 전 세계적으로 패션프루트에는 Fusarium에 의한 시들음병원균으로 F. oxysporum, F. oxysporum f. sp. passiflorae, F. oxysporum var. redolens 등이 기록되어 있다(Farr와 Rossma, 2017), 국내에서는 바이러스병 5종 - 동아시아시계초바이러스(East Asian Passiflora virus, EAPV), 오이모자이크바이러스(Cucumber mosaic virus, CMV), 등대풀잎말림바이러스(Euphorbia leaf curl virus, EuLCV), 파파야잎말림광동바이러스(Papaya leaf curl Guangdong virus, PaLCuGdV) 및 토마토황화잎말림바이러스(Tomato yellow leaf curl virus, TYLCV)이 확인되었을 뿐이다(Hong, 2017). 2014년부터 2016년까지 전라북도농업기술원(익산)과 국립원예특작과학원 온난화대응농업연구소(제주)의 시험연구포장에 식재한 패션프루트 ‘Panama Red’에서 시들음병이 발생하였다. 병든 식물에서 병원균을 순수 분리한 후 단일균주를 확보하여 균학적 특성 및 DNA 염기서열을 토대로 F. oxysporum으로 동정하였고, 패션프루트 유묘에 인공 접종하여 병원성을 확인하였다. 따라서 본 연구는 패션프루트 시들음병의 병징, 균학적 특징, 병원성 검정 및 염기서열 분석결과를 보고하고자 한다. 2014년부터 2016년까지 전라북도농업기술원(익산)과 국립원예특작과학원 온난화대응농업연구소(제주)의 비닐하우스에 패션프루트 ‘Panama Red’ 삽목묘를 2 m×2 m 간격으로 정식하였다. 시들음병은 정식 60일 후부터 계속해서 묘목에 발생하였다. 병징은 생육 초기에는 건전주에 비해 생육이 더디고 새순부터 시듦증상이 나타나기 시작하였으며, 상위엽에서부터 하위엽으로 잎마름 증상이 보였다. 오래된 잎은 마르고 뒤틀리다가 더 이상 생육을 하지 않고 갈변되었으며, 결국 말라 죽었다(Fig. 1A). 병든 식물의 땅가부위는 물관이 부패한 상태로 흑갈색으로 썩어 있었으며, 뿌리는 건전주에 비해 활력이 없고 발달이 약한 상태이었다(Fig. 1B). 감염된 뿌리를 자르면 병원균에 감염된 물관이 갈색으로 변색되어 있었으며, 낮에는 시들고 밤에는 다소 회복되는 증상이 반복되었다. 그러나 박과작물에서처럼 땅가부위에서 끈적끈적한 진갈색 수액이 병든 조직으로부터 누출되지는 않았다. 이와 같은 증상은 2016년 익산과 제주의 농가포장에서도 동일하게 나타났다. 피해를 받은 농가에 따르면 같은 증상이 매년 반복되었으며, 수량 감소에 크게 영향을 미치는 병해 중의 하나로 인식하고 있었다. 익산과 제주의 서로 다른 패션프루트 재배포장에서 조사된 시들음병의 발병률은 2.8-5.6%이었다. Fusarium wilt caused by Fusarium oxysporum on passionfruit. (A) Occurrence of Fusarium wilt in a farm in July 2016. (B) The stem was infected, devastating the whole plant. The vascular system was blocked by the fungus. (C, D) Macroconidia and microconidia. (E) Monophialides with macroconidia on hypha. (F) Monophialides with microconidia on hypha. (G) Microconidia. (H) One-week-old colony of F. oxysporum growing on a potato dextrose agar. 병원균을 분리하기 위하여 발병 포장에서 병든 식물체를 채집하여 땅가부위의 건전한 부위와 병원균에 감염된 부위의 경계조직을 5×5 mm 크기로 잘라 1% NaOCl 용액에서 1분 동안 표면살균하고 멸균수로 2-3회 세척한 후 멸균된 여과지에서 물기를 제거한 다음 물한천배지(WA)에 치상하였다. 25°C 항온기에서 3일간 암배양한 후에 균사체 선단부를 떼어내 감자한천배지(PDA)(Difco, MD, USA)에 옮겼으며, 25°C 항온기 내에서 7일간 배양하여 병원균의 균학적 특성을 조사하였다. 병든 식물체에서 여러 균주가 분리되었으나 형태적으로 동일하였다. 따라서 대표균주를 농업유전자원정보센터(Korean Agricultural Culture Collection)에 기탁(기탁번호 KACC48307)하였으며, 병원성 검정 및 염기서열 분석에 사용하였다. 병원성 검정은 자색종 패션프루트에서 실시하였으며, 검정방법은 Gardner (1989)의 방법에 따랐다. 접종을 위한 식물체는 모래에서 키운 삽목묘로 첫잎이 출현한 단계(cotyledon stage)의 식물체 5주를 선발하여 사용하였다. 접종원은 기탁균주를 감자한천배지에서 1주간 배양한 후 멸균수를 넣고 메스(scalpel)로 포자를 수거하여 거즈로 거른 포자현탁액(106 conidia/ml)을 사용하였다. 건전한 식물체 뿌리부분을 포자현탁액에 5분 정도 침지한 후에 버미큘라이트(vermiculite)에 옮겨 심어 생육하였으며, 대조구는 5주를 선발한 후에 멸균수를 이용하여 침지하였으며, 접종구와 동일하게 생육하였다. 접종한 식물체는 25±1°C로 유지되는 생육상에서 12시간 광주기 및 80% 상대습도를 유지하였다. 접종 4주 후에 포장과 같은 전형적인 시듦 증상이 나타나기 시작하였으며, 땅가부위가 갈변되었고 발병포장에서와 동일한 병원균이 분리되었다. 따라서 패션프루트 시듦 증상에서 분리한 병원균은 병원성을 가진 균주로 판단되었으나 대조구에서는 병징이 나타나지 않았다. 병원균의 형태적 특징은 기탁균주를 감자한천배지에 7일 동안 배양하여 Stereo 현미경(SteREO Discovery V8, Zeiss)과 DIC (differential interference contrast) 모듈이 장착된 광학현미경(AXIO, Zeiss, Oberkochen, Germany)에서 200-1,000배로 관찰하였다. 균사와 분생포자경, 분생포자의 형태와 크기(n=30) 등은 AxioVision LE Module Interactive Measurement (Zeiss) 프로그램을 이용하여 측정하였다. 감자한천배지에서 균사 생육은 직경이 35 mm/7일이었으며, 핑크빛-흰색으로 양모상이었다(Fig. 1H). 병원균의 형태적 특징은 monophialides 위에 소형분생포자를 형성하고 있으며, 낫 모양의 대형분생포자도 관찰되었다. 대형분생포자는 무색으로 투명하며, 길이가 짧고 굴곡진 모양-일자형으로 세포벽이 얇고 주로 2-3개의 격벽이 있었다. 소형분생포자는 균사로부터 monophialides위에 형성되었으며, 투명하고, 난형-타원형이며, 격벽이 없거나 1개인데, 드물게 2개인 경우도 있었고, 크기는 3-12×2.5-6 μm였다(Fig. 1C-1G). 형태적 특징을 기초로 한 병원균의 동정을 뒷받침하고자 염기서열 분석을 실시하였다. 기탁균주를 감자한천배지에서 1주일 동안 배양한 후 ribosomal DNA (rDNA)의 internal transcribed spacer (ITS) 영역과 Fusarium 종의 동정에 널리 이용되는 Translation Elongation Factor 1-alpha (EF-1α) 유전자의 염기서열을 분석하였다(Hsuan 등, 2011). Genomic DNA는 DNeasy Plant Mini kit(QIAGEN, Valencia, Canada)를 이용하여 분리하였고, ITS1/ITS4(White 등, 1990)와 EF-1/EF-2 (Geiser 등, 2004) primer 등을 이용하여 PCR로 증폭하였다. 증폭시킨 PCR 산물은 1.5% agarose gel에서 전기영동하여 band를 확인한 후, PCR purification kit (CoreoneTM, Core-bio, Seoul, Korea)를 이용하여 정제하였다. 염기서열은 autosequencer (ABI 3030)로 분석하였으며, 최종 획득한 ITS와 EF-1α의 염기서열들은 GenBank database (National Centre for Biotechnology Information [NCBI], US National Institute of Health Bethesda, http://blast.ncbi.nlm.nih.gov/Blast.cgi)와 Fusarium-ID (http://isolate.fusariumdb.org/blast.php)의 데이터베이스에서 확인하였다. 계통수 분석을 위해 GenBank 데이터베이스의 ITS, EF-1α 염기서열을 이용하였으며, 계통수는 MEGA 6.0 프로그램을 통해 neighbor-joining 방법으로 작성하였다. Sequence distance는 Tajima-Nei parameter model로 계산하였다(Saitou와 Nei, 1987; Tamura 등, 2013). 패션프루트 시들음병을 일으키는 KACC48307 균주의 ITS 영역의 길이는 544 bp로 NCBI의 GenBank 등록번호는 MG356946이다. NCBI에서 Blastn search한 결과 F. oxysporum로 등록된 GenBank accession number KP995455, KU901515, KJ475803, KF786127, KF671955, KF156304, KY786126 등과 >99% 일치하였다. 또한 EF-1α 유전자는 712 bp로 GenBank 등록번호는 MG356947이며, NCBI에서 Blastn search 했을 때 F. oxysporum로 등록된 GenBank accession number KX431987, KJ127285, FJ538245, KJ699111, KX609708, KR108799 등과 >99% 일치하였다. 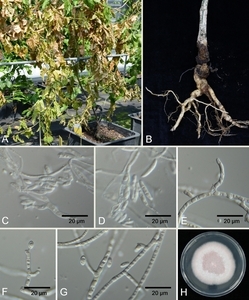 또한 Fusarium ID 데이터베이스에서도 F. oxysporum로 등록된 ITS의 FD_0638, FD_0213, FD_0270, FD_0342, FD_0297 등과 >99.5%, EF-1α의 FD_00793, FD_00788, FD_00741, FD_00718, FD_00714 등과 100% 일치하였다. 계통수작성 결과 ITS (MG356946)와 EF-1α (MG356947)의 염기서열 모두 F. oxysporum과 같은 계통군에 속하였다(Fig. 2, 3). Phylogenetic analysis inferred by the neighbor-joining method comparing the internal transcribed spacer ribosomal DNA(rDNA) region of Fusarium oxysporum with those of other Fusarium species retrieved from GenBank. The numbers above the branches represent the bootstrap value. The fungi identified in this study are boldfaced. 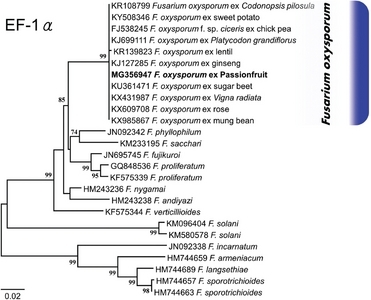 Phylogenetic analysis inferred by the neighbor-joining method comparing the translation elongation factor 1α of Fusarium oxysporum with those of other Fusarium species retrieved from GenBank. The numbers above the branches represent the bootstrap value. The fungi identified in this study are boldfaced. 이상과 같이 패션프루트 시들음병을 일으키는 병원균을 분리·배양하여 형태적 특징과 염기서열 분석, 병원성 검정을 기초로 ‘F. oxysporum E.F. Sm. & Swingle’로 동정하였다(Nelson 등, 1983; Lee와 Park, 2001). F. oxysporum에 의한 패션프루트 시들음병은 브라질, 케냐, 말라위, 남아프리카공화국, 호주, 뉴질랜드 등에서 보고되어 있으나(Farr와 Rossman, 2017), 우리나라에는 기주 미기록종이다(The Korean Society of Plant Pathology, 2009). 따라서 이상의 균학적 특징, 병원성 검정, ITS rDNA, EF-1α 염기서열 비교분석 등의 결과를 바탕으로 이 병은 우리나라에서 지금까지 보고되지 않은 F. oxysporum E.F. Sm. & Swingle에 의한 ‘패션프루트 시들음병’으로 명명하고자 한다. 패션프루트에서 F. oxysporum complex를 포함하는 토양 병해를 방제하기 위한 일반적이고 효율적인 방법은 저항성 품종을 심는 것이다. 화학적 방제의 경우에는 병원균이 토양 내에서 빠르게 재정착(recolonize)되기 때문에 비효율적으로 알려져 있다(Flores 등, 2012). 2014년부터 2016년까지 전라북도농업기술원(익산)과 국립원예특작과학원 온난화대응농업연구소(제주)에서 패션프루트 시들음병이 관찰되었다. 병징은 생육 초기 건전주에 비해 생육이 더디고 새순부터 시듦 증상이 나타나기 시작하였으며, 오래된 잎은 마르고 뒤틀리다가 더 이상 생육하지 않고 말라 죽었다. 감자한천배지에서 균사 생육은 직경이 35 mm/7일이었으며, 핑크빛-흰색으로 양모상이었다. 병원균의 대형분생포자는 무색으로 투명하며, 길이가 짧고 굴곡진 모양-일자형으로 세포벽이 얇고 주로 2-3개의 격벽이 있었다. 소형분생포자는 균사로부터 monophialides 위에 형성되었으며, 투명하고, 난형-타원형이며, 격벽이 없거나 1개인데, 드물게 2개인 경우도 있었고, 크기는 3-12×2.5-6 μm이다. 균학적 특징, 병원성 검정, ITS rDNA, EF-1α 염기서열 비교분석 등의 결과를 바탕으로 이 병은 우리나라에서 지금까지 보고되지 않은 Fusarium oxysporum에 의한 ‘패션프루트 시들음병’으로 명명하고자 한다. This study was carried out with the support of “Cooperative Research Program for Agricultural Science & Technology Development(Project No. PJ011966022017)” Rural Development Administration, Republic of Korea. Agrios G. N. (2005). Plant Pathology . Elsevier Academic Press, Amsterdam, The Netherlands. Lee Y. S, and Park C. S. (2001) Fusarium species of Korea. Plant Pathogens of Korea 5 , pp.91. National Institute of Agricultural Science and Technology, Suwon, Korea. Flores P. S, Otoni W. C, de Dhingra O. D, Souza Diniz S. P. S, Dos Santos T. M, and Bruckner C. H. (2012) In vitro selection of yellow passion fruit genotypes for resistance to Fusarium vascular wilt. Plant Cell Tissue Organ Cult 108, 37-45. Gardner D. E. (1989) Pathogenicity of Fusarium oxysporum f. sp. passiflorae to banana poka and other Passiflora spp. in Hawaii. Plant Dis 73, 476-478. Geiser D. M, Jimenez-Gasco M. D, Kang S. C, Makalowska I, Veeraraghavan N, Ward T. J, Zhang N, Kuldau G. A, and O'Donnell K. (2004) FUSARIUM-ID v. 1.0: a DNA sequence database for identifying Fusarium. European J. Plant Pathol 110, 473-479. Hong S. B. (2017) Development of a Multiplex PCR System for diagnosis of Major Passionfruit Viruses and Their Epidemiology in Korea. The graduate school dissertation , 88. Hsuan H. M, Salleh B, and Zakaria L. (2011) Molecular identification of Fusarium species in Gibberella fujikuroi species complex from rice, sugarcane and maize from peninsular Malaysia. Int. J. Mol. Sci 12, 6722-6732. ., Ministry of Agriculture Food and Rural Affairs (2017) Statistics of Cultivation and Production of Industrial Crops in 2015. . Korean Ministry of Agriculture, Food and Rural Affairs, Sejong. Nelson P. E, Toussoun T. A, and Marasas W. F. O. (1983) Fusarium Species: an Illustrated Manual for Identification. , 142-145. ., Rural Development Administration (2014). , pp.187. New Subtropical and Tropical Fruit, Jeonju, Korea. Saitou N, and Nei M. (1987) The neighbor-joining method: a new method for reconstructing phylogenetic trees. Mol. Biol. Evol 4, 406-425. Silva A. D. S, Oliveira E. J. 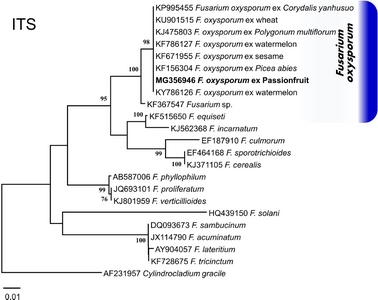 D, Haddad F, Laranjeira F. F, Jesus O. N. D, Oliveira S. A. S. D, Costa M. A. P. D. C, and Freitas J. P. X. D. (2013) Identification of passion fruit genotype resistant to Fusarium oxysporum f. sp. passionflorae. Trop. Plant Pathol 38, 236-242. Tamura K, Stecher G, Peterson D, Filipski A, and Kumar S. (2013) MEGA6: molecular evolutionary genetics analysis version 6.0. Mol. Biol. Evol 30, 2725-2729. ., The Korean Society of Plant Pathology (2009). List of Plant Disease in Korea , 853. White T. J, Bruns T, Lee S, and Taylor J. (1990) Amplification and direct sequencing of fungi ribosomal RNA genes for phylogenetics. In: PCR Protocols: a Guide to Methods and Applications, Innis M.A, Gelfand D.H, Sninski J.J, and White T.J (eds.) . Academic Press, San Diego, CA, USA.